America is well known for it's fantastic food (and huge portions!) so naturally, the cuisine became a focal point of our visit to Chicago. From pancakes to pizza, I've pulled together some of my favourite locations to eat in the city. 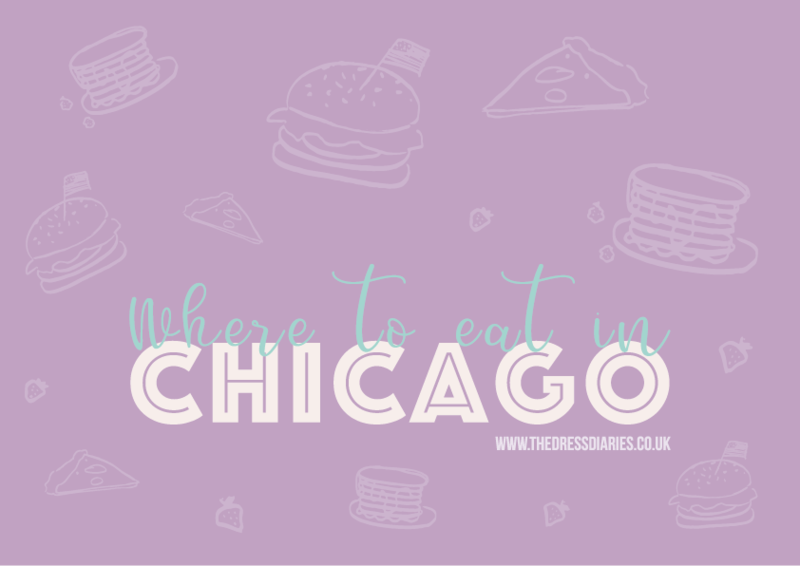 If you want to see what else I got up to - other than eating my own weight in 3 Musketeers bars - then check out my 'Sightseeing in Chicago' post. A very cosy, simple brunch place with everything from chicken to waffles - or even go all out with a skillet if you're particularly peckish. This was one of the first suggestions I found when looking for a waffle house nearby, and as one of the cheapest independent places we visited, I'd definitely recommend for the traveller on a budget. I opted for the special belgian chocolate waffles with banana, with lashings of maple syrup. As always in Chicago, expect a LOT of food and there's refillable coffee to keep you buzzing for the rest of the day. This was actually an alternative restaurant we fell into (as our planned first option was full) and WOW, I'm so glad we did. Noted as the home of the fourth best deep dish pizza in America (and Oprah Winfrey's #1 favourite thin crust, I kid you not) we felt we were very lucky to have stumbled across this slice of heaven. We opted for the veggie option of 'Mark's Special', featuring a chunky slab of cheese topped with tomatoes, basil and garlic. It's the absolute pinnacle of pizza pie and as greedy as this sounds, this was one of my favourite experiences of the city. Absolutely delish. If you're wanting to experience a true Chicago deep dish, definitely head to a Pizano's. Courtesy of our lovely taxi driver from the airport, we had a tip to visit here to try out a true, cheap hot dog experience. Portillo's is a budget food hall with a range of options including burgers, pasta, ice cream and of course, all kinds of hot dog. You can grab soft drinks or a beer and a selection of different snacks to share at a low price, making it perfect for large groups or families. I went for a classic Chili Cheese Dog and it was tasty, albeit messy! This is far from a gourmet experience but I would recommend a visit with friends, and it would be fantastic for satisfying drunk food cravings. This is the ultimate place to be for breakfast. It's actually the only place I stopped to take a picture before eating (terrible blogger, I know) so I'll just let the photo do the talking. This the Signature Berry Bliss Pancakes dish which, although resembling a Man Vs Food challenge, was incredibly delicious. We loved this place so much we actually went back the following day and I tried a savoury omelette too. Recommendations are the pancakes (banana and choc chip also a winner!) and the meat skillets, as they also looked incredible.